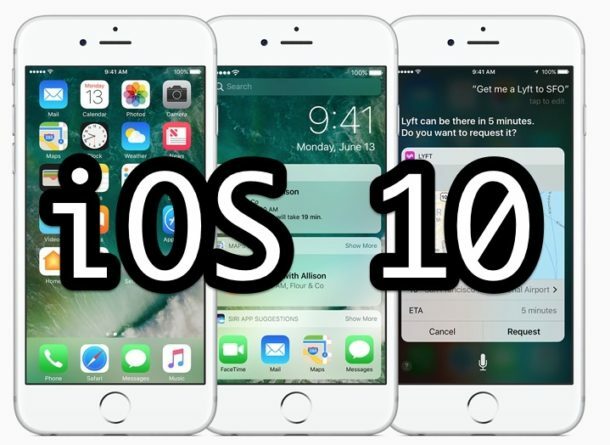 Apple has released iOS 10, the latest software update for compatible iPhone, iPad, and iPod touch devices. The new system software release includes many new features and enhancements to the iOS experience, including a dramatically overhauled Messages app complete with animations, stickers, and sketching, improvements to Maps, redesigned Notifications, a new lock screen experience, a redesigned Music app, new Photos app features, and much more. You can prepare for iOS 10 or if you’re impatient you can always dive right into the update too, but do be sure to at least backup beforehand. All modern iPhone and iPad hardware supports the release, you can check the full iOS 10 compatibility list here if you are uncertain if your specific device is supported. 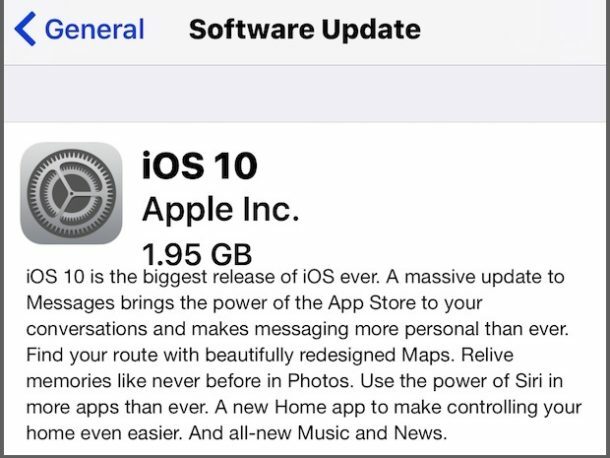 Users can download and install the iOS 10 update through the Over The Air update mechanism on the iPhone or iPad itself. The update is somewhat large and requires about 2.5 GB to 3 GB of free space to install, though most of that storage space should become available again after the update has completed. Another option is for users to update to iOS 10 through iTunes. Be sure to get the latest version of iTunes if you’re going that route, a new version was released today. Updating iOS through iTunes is simply a matter of connecting the iPhone or iPad to the computer, launching iTunes, and choosing the update button. Finally, more advanced users can choose to update to iOS 10 by using IPSW firmware files, which also requires iTunes. The direct download links for iOS 10 IPSW are available below. The iOS 10 final build is 14A403 and is technically versioned as iOS 10.0.1, making it the same release as the iOS 10 GM. Some users are encountering various error messages when attempting to update iOS 10 system software. Two of the most common error messages are “Unable to Install Update” and getting stuck on “Verifying Update”, which are typically remedied by simply waiting a bit and retrying. The update servers at Apple are likely swamped with update requests, and often just waiting a short while will resolve any of the error messages. Some users are discovering that iOS 10 update fails or iOS 10 update wants to connect to iTunes, with the connect to iTunes screen appearing on the display of the iPhone, iPad, or iPod touch. Why this happens is unclear, but unfortunately it means the device must be connected to iTunes on a computer using a USB cable to complete the update. You can read more about the iOS 10 update failure requiring iTunes here. Separately, Apple has released watchOS 3 for Apple Watch, tvOS 10 for Apple TV, and iTunes 12.5.1 for Mac and Windows. Did you install iOS 10 yet? What has been your experience? Let us know in the comments. Same happened here. There’s an update for iTunes (12.5.1) – if you install that before restoring it will give you iOS 10.0.1, although I’ve had the download time out a few times now (probably due to busy servers). I tried to install iOS 10 update through the Settings app and it failed, now I have to connect to iTunes. I think the servers are busy, I would wait to update. I would also not update unless you are near your computer just in case you get the iTunes required screen and necessity to restore the device. This happened on iPhone. I downloaded the new version of ios 10, press install button, after the installation complete, just received “connecto to itunes logo”, reboot the iphone and that error persist on it. I connect the iphone to my macbook pro and received a msg that need to restore my iphone, press the restore and update button on my mac, and received a new error msg #1671. Not a great experience as it forced a recovery and iTunes took my iPad back to iOS 9.3.5 (luckily) Seems to be a few problems. Similar experience. Update failed to install on both iPhone 6S plus and my iPad Pro. Just connected my iPhone to the Mac in the hope that this might sort it. Poor show, Apple. This needs fixing. I installed Android OS on my iPhone. Now I can’t send messages and many other things don’t work. Will someone help me?? I think I found a workaround: download windows xp for mobile, and use iTunes to install it on your iPhone. If it’s done install the required drivers. What about my things? The update is no good!! I will need to roll back to 9.3.5 ffffff this is not like apple!! What went wrong??? You might need to update to iTunes 12.5.1 first (in software update) to get the iOS 10 update…. looking into it. In any way it will go back to ios 9.3.5 so…. My stuff will be gone right? Recommended way is to do it via iTunes. Backup to iTunes before you upgrade. In case any issues, you are able to go back to 9.3.5 though you’d need to have the IPSW file beforehand and also know how to get the iPhone into DFU mode. Pretty sure all the new IOS 10 IPSW files for 6/6 Plus are now universal…. the file names are now named after the screen size. Ok apple you cause us trouble…..champions league is on!!! So i will deal you later!! Thanks you guys for all the help! I have an iPhone 6s…updated iTunes, downloaded the IPSW, and installed via USB with no problems. Took a while for apps to download. Afterwards my 6s is performing as well as before the update. Does iPhone 6s and iPhone 6 have same IPSW files ? The update went great on iPhone 6 and iPad Air 2 without any issues, I did wait until late afternoon to down the upgrade to the phone and completed the iPad upgrade this morning. I had installed the Last public beta. I tried to update to the final version which is the same as the GM. However the Feedback app remains on the phone. I can’t delete it. Is there a way to get rid of it short of a clean install? Major Up dates way too often – just getting to be able to use features and right away Apple changes it all again – Halt, Wait Let me get off the train. Find something I like then weeks later it is GONE! Worst move I’ve ever made on my 6s! Nothing but problems! Contacts gone, calendar gone, iMail gone! I see Apple is looking out for us; that is if you can afford to update from an iPad2 for $600 or more. Gee, thanks Apple for making my iPad obsolete. I installed with no issues. However I do not have the same features or functions that other iOS 10 update users have?? Please let me know that why is happening….